Médecins Sans Frontières (MSF) teams in Malakal worked through the night to deal with new patients, injured after fighting erupted in the Protection of Civilians (PoC) site on Thursday that resulted in 18 people dead, two of them MSF South Sudanese staff members. Seventy-three patients have been admitted so far to the hospital, 46 of them with gunshot wounds. The fighting has calmed down significantly since yesterday evening, despite some limited gunfire during the night. After temporarily suspending activities in the hospital due to the fighting, the team was able to return and continue working. Two clinics in the camp belonging to other aid organisations were destroyed. One of MSF’s main concerns is the fate of 43,000 internally displaced people (IDPs) who took shelter in the United Nations Mission in South Sudan (UNMISS) compound. They have been squeezed into a very tight area and access to water and sanitation is of real concern. MSF does not know how long they will be permitted to remain in the facility. Kids playing in the Malakal PoC site. 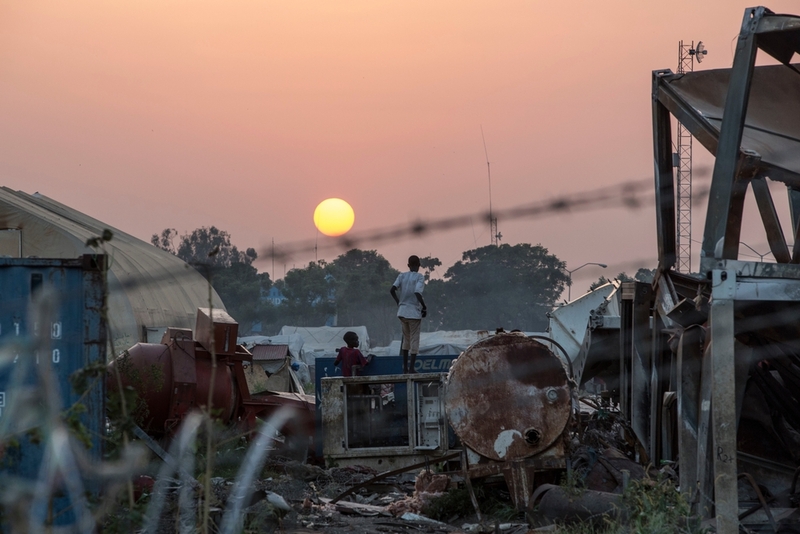 “After more than two years of conflict, the only system developed by the UN to protect vulnerable populations in South Sudan has been the creation of Protection of Civilians areas”, said Johanna Van Peteghem, deputy regional program manager for MSF. “It's clear that this system is insufficient, as it protects only a small number of the population at risk." "The PoCs are being presented as the only solutions on the table, leaving the rest of the country abandoned and to its own devices". People have been sheltering in the PoC site in Malakal since conflict erupted in December 2013. The population of the site more than doubled last year, following an influx of 10,000 displaced people in April and a further 16,000 in July to August.